1.High quality material: our waist trainer upgraded material, having a great function of ductility. 2. 3 rows of hook-and-eye and steel boned can effectively keep a tight fit around your waist to achieve long lasting waist cinching effect as losing weight. And underbust design will not be squeezed to the chest, but rather the chest a perfect support. 3. The waist cincher corset helps define your waistline and smooth your body for a more natural, more hourglass figure. 4. Perfect for everyday wear, workout and pregnancy recovery. The waist slimming corset with 3 hooks & eyes allows you to adjust the compression you need, while instantly firm your abdominal area. The waist trainer corset with 4 spiral steel bones can provide extra support to lower back pain and keep you in the best posture. This waist shaper features with durable high compression fabric holding everything in comfortable, lightweight and breathable standard. High compression around your waist can reduce your waistline by more than 3 inches to give you a desired hourglass figure. This waist trainer shaper slimmer is about 28cm in length, so it is suitable for long torso. When you put it on, it will cover pretty much your entire stomach, especially the fat and abdomen. This Underwear corset for women can be matched in any clothes in the daily work. And it is perfect for outdoor activities like running, yoga and hiking. 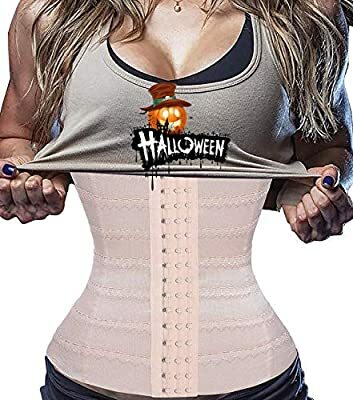 Multifunctional Waist Cincher- The efficient waist trainer can flatten abdomen, reduce waistline, support back, postpartum recovery, improve posture, warm muscle and relief waist pain. We are confident that you will love your waist cincher girdle! Making you 100% satisfied is our priority! If you are not happy with your product we offer free return or full refund.